Release Date: October 27th, 2006 (Loews Village 7 and AMC Empire 25) by Magnolia Pictures. BASIC PREMISE: A documentary about the cocaine trade and drug wars in Miami during the 1970s and 80s. ENTERTAINMENT VALUE: This lively and stylish documentary takes a look at what Miami was like during the dangerous times of the 1970s and 80s when drug lords had a lot of control over the economy and society. These events inspired Miami Vice and Scarface. Back then, cocaine was so popular that you could find it almost everywhere, especially in clubs, casinos and bars. Mickey Munday and Jon Roberts, both a drug traffickers, explain how they transported many packages of cocaine into Miami while—for the time being—avoiding arrest. In fact, many police officers were corrupt enough to accept bribes which allowed the traffickers to continue their business. Not surprisingly, Miami banks had an excess of incoming cash nearly 60 times the average amount. 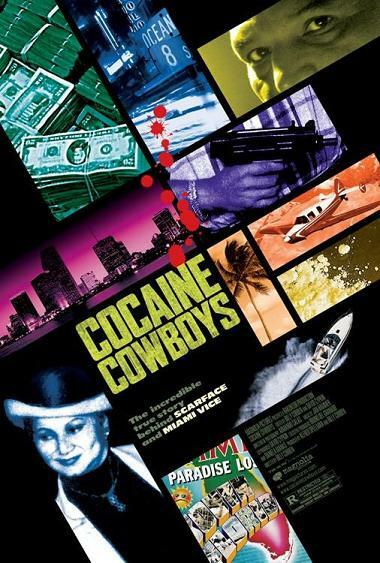 Cocaine Cowboys becomes even more riveting during the second half which show documents the violence when Columbian drug lords entered the industry. Griselda Blanco, a.k.a. the Columbian Godmother, was responsible for hiring many hit men to take care of business, so-to-speak. One particular hit man, Jorge Ayala, while serving a life sentence, gives his account of how he killed innocent children and other people for his boss, Griselda. Director Billy Corben keeps the film moving at a fast, energetic pace without any redundant or dull interviews. Moreover, he wisely includes plenty of well-edited, stylish footage and images so that this isn’t merely a talking-heads documentary. Even though the outcome of all these events are pretty obvious, Cocaine Cowboys remains engaging and riveting throughout. SPIRITUAL VALUE: None, but at least you now know that Miami wasn’t always the ideal vacation place. INSULT TO YOUR INTELLIGENCE: None. IN A NUTSHELL: Riveting. A lively, stylish and thoroughly engaging documentary.